When a human body is checked against the boards you hear a resounding thud. When hockey sticks meet you hear an electric slap across the arena. When 200 pounds of gladiator skates towards the puck and the blades cut into the ice you hear a swooshing sound slice through the air. And when the puck slides into the opposing team’s goal you hear the cheers of thousands of Seattle Thunderbirds fans as they jump to their feet and roar. Yes, when you attend a WHL hockey game at Accesso ShoWare Center in Kent there is no doubt you are in the hometown roost of the Thunderbirds. I took my son to a game, we groaned in sympathy as a Thunderbird hurtled through the air and into an opposing player knocking gloves and helmets asunder. We clapped and danced with “Cool Bird” the T-birds Mascot. 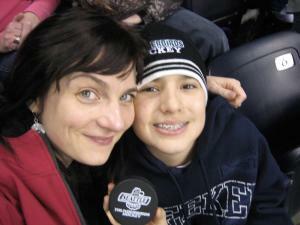 At one point my son looked at me and grinned and said “I’m proud of you Mom.” Without realizing it I had morphed from a mild mannered Mom into a rowdy hockey fan and somewhere along the line earned “coolest Mom ever” status in the eyes of my son. Visit the Southside and make your own family memories.